My 401K contributions maxed out at $24,000. Both my wife and I are over 50 and would like to contribute $5,500 each to traditional IRAs to reduce our tax burdan, based on my income and her LTD settlement. Is this possible? From the IRA document titled 2015 IRA Deduction Limits the answer appears to be 'no'. Still you need to calculate your MAGI to be sure. First, there are no income limits to contribute to a Traditional IRA. Anyone with income can contribute. You may be asking about deducting a Traditional IRA contribution, for which there is an income limit in some circumstances. 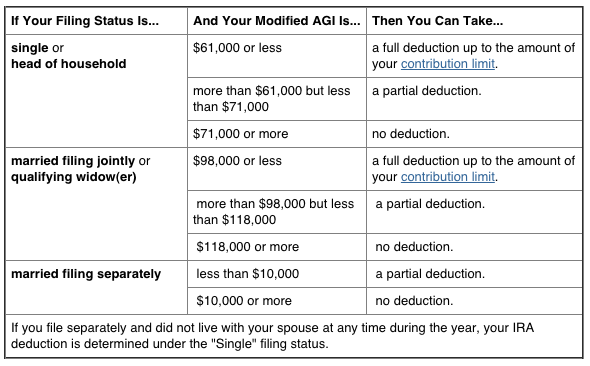 Since you contributed to a 401k this year, your ability to deduct your contribution will be phased out at an MAGI of $98,000 - $118,000, if you file as Married Filing Jointly. (We don't even need to consider Married Filing Separately because the phaseouts for that are always 0 - $10,000.) So in this case you will not be able to deduct at all. You did not say whether your wife was covered by an employer retirement plan this year. If she was, she would be in the same situation as you. If she was not, then as her spouse contributed to a 401k this year, her ability to deduct her contribution will be phased out at an MAGI of $183,000 - $193,000. So in this case she should be able to deduct the maximum contribution of $6,500 (since she is over 50). Not the answer you're looking for? Browse other questions tagged united-states taxes 401k ira contribution or ask your own question. Are “pre-tax” contributions to Traditional IRA a lie?